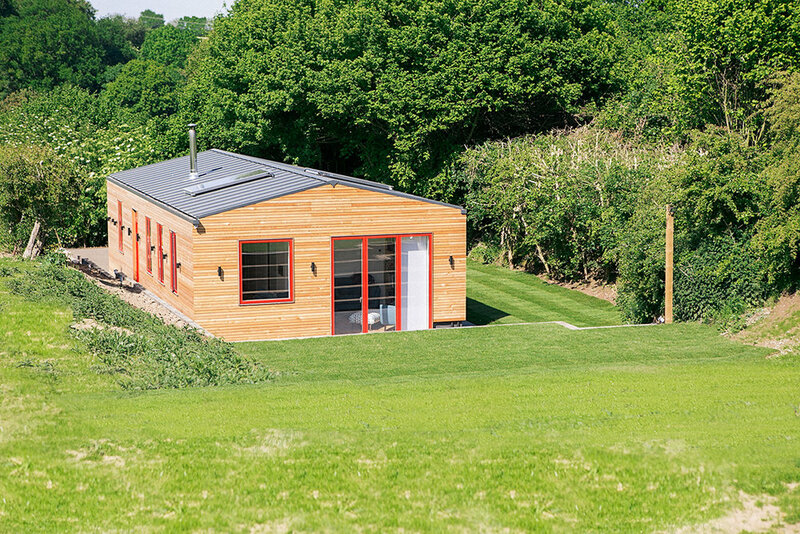 Brambles Barn is located in an isolated location in the countryside. Planning approval was gained for Brambles Barn via the Prior Approval Part Q (agricultural barn to dwelling) route. It was one of the first examples of using the new Prior Approval laws to gain planning permission for a dwelling in the Mid-Suffolk area. Prior to this project the local council had resisted such developments but Brambles Barn lead the way for many more to follow. The driving force behind the project was to create a highly sustainable and healthy off-grid dwelling. Within the restrictions of the Prior Approval the design still had to delight and while being built on a shoe string it still aspired to be highly bespoke. The completed dwelling is energy efficient with high levels of insulation and minimal cold bridging. The wall construction is air tight but breathable and completely made with natural materials with no VOC content, right down to the choice of paint. This creates an extremely healthy place to live which passively manages the background humidity of the internal spaces. 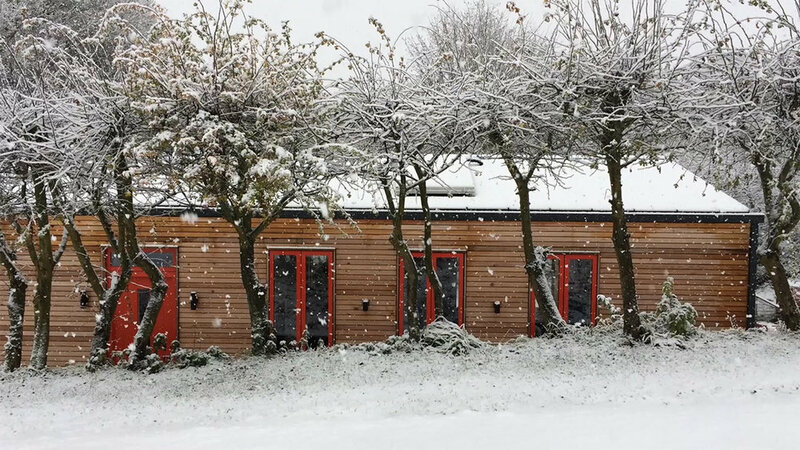 Materials include the timber superstructure with sheeps-wool insulation; wood fibre board and breather membrane wrap around the exterior and are clad with a horizontal Siberian larch board on battens. 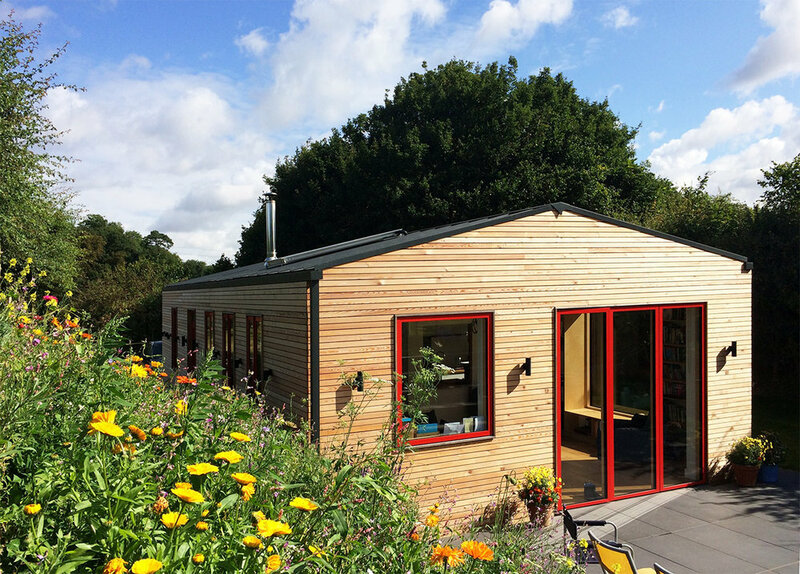 The same Siberian larch is used to externally frame the aluminum clad timber windows and doors. Internally the walls are lined with a gypsum Fermacell board drylining system and finished with Auro paint. The roof is also insulated with sheeps wool and finished in Colorcoat Urban by Tata Steel. Roof flashings and gutter details are bespoke products developed specifically for this project. Internal joinery is all birch ply and includes a beautiful built-in shelving unit that frames a window seat. Great care was taken with the lighting design and a completely bespoke stainless steel switch design was developed, commissioned and installed in the house. This includes a central switching board designed as a schematic of the dwellings’ plan on which the whole house lighting can be controlled.